Taking a little boat up to a platform in the middle of the ocean to watch a movie would be outrageously cool. Although I'm still thinking about whether if you are sea sick prone it would be a problem, but wow... what an experience it would be! 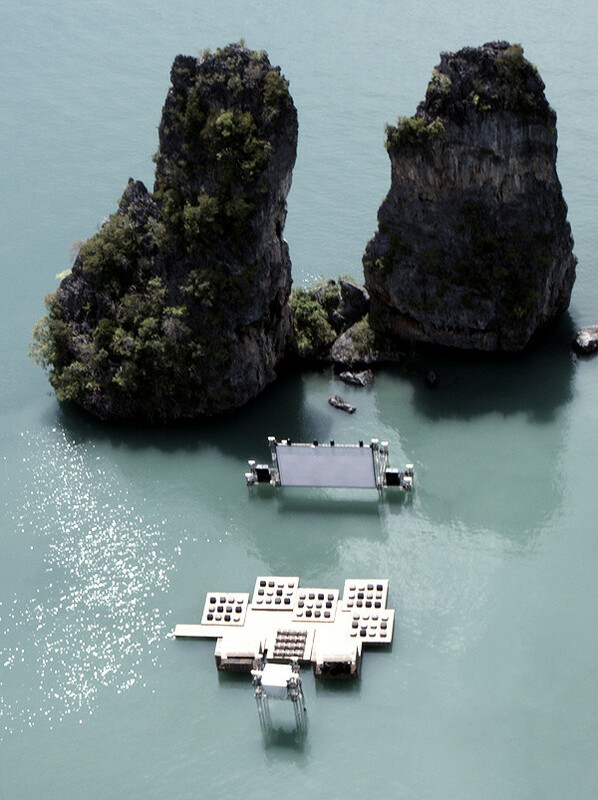 This particular movie going experience took place in Yao Noi, Thailand and was put on by Film on the Rocks Yao Noi and designed by architect Ole Scheeren who built the large raft out of recycled materials. Yes please, sign me up for the next one. Amazing. I can't think of anything better! ocean seating + movie on the bigscreen = one amazing date night! I want to live like this!!! Well this is just plain COOL. THAT is fabulous! Bucket list just got one more line. wow!! I love it! I thought the one overlooking Sydney Harbour Bridge - but it pales compared to this. Especially great to swim out and swim back. wow. Now that is something that I have never imagined possible. WOW!!! Sign me up as well! SIMPLY AMAZING:) I really love your blog and I will happily follow. this is amazing. i can't think of a cooler way to see a movie! imagine this at night with all the stars in the sky.... totally a unique movie experience! this. is. AMAZING! who thinks of this stuff? and better yet, executes it and makes it happen. so awesome. thanks for sharing! xo. wowwwwww, I'm amazed. must go! Out of this world, double dose of cool.